April showers bring May flowers... right? Today we are sharing a simple salad spinner art craft we did with a coffee filter umbrella filled with foam button flowers. 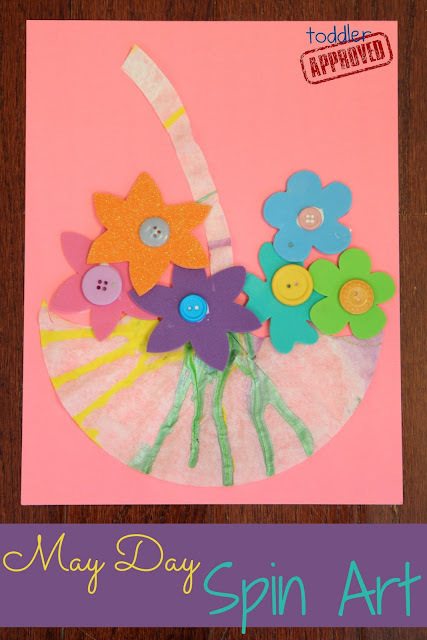 May Day Spin Art is colorful, simple, and sure to be a hit with your little ones! Add a coffee filter into the salad spinner, drop some paint in (add some water if your paint isn't droppy enough), and spin, spin, spin! Let the coffee filters dry! Cut them in half. Use one half as the top of an umbrella and part of the other one as an umbrella handle. Glue it on to a piece of cardstock. Let it all dry and then give your masterpiece to a friend to WELCOME MAY! Bring on sunshine, warm weather, swimming, popsicles, and flowers! Welcome May! April was exhausting and filled with far too many sleepless night over here, so I am off to bed so that I can welcome May with loads of energy. I so want to go out and buy a salad spinner *just* so I can do salad spinner art! !